I just love the watch and the bangle that came with it. I wear the bangle all the time and I've had so many people comment on the watch. It looks expensive, and it fits so good. 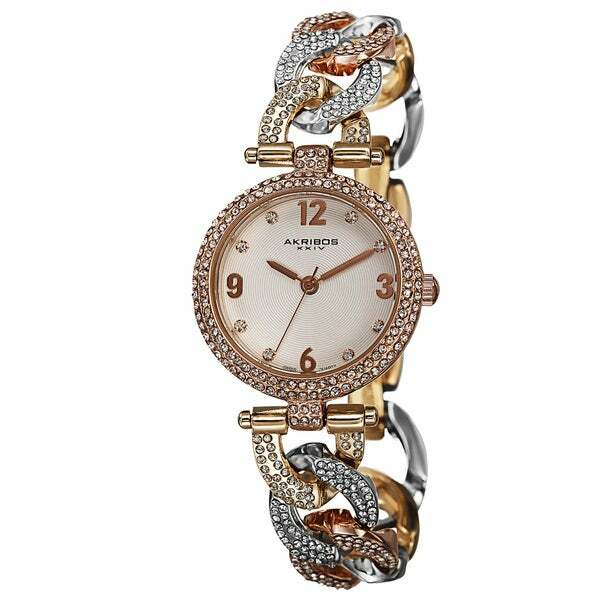 Elegant and chic, this watch from Akribos XXIV features beautiful crystals all around. The precise quartz movement and unique style make this watch a keeper. Let it sparkle on your wrist on the next occasion! Dimensions 11.0 In. X 2.0 In. X 1.0 In. This is a very interesting looking watch. It is tri-colored, crystal accented and very dainty. I really like the look; but, one thing concerns me. It is extremely light weighted, Something to be aware of. I received my new watch yesterday and it is beautiful! I needed a watch for dressier wear and this is it. The band adjusts easily, and the dial numbers are easy to read (a plus for me). I also like the subtle mix of metals. An absolutely beautiful and chic watch. Very nice and cannot beat the price. This was a beautiful birthday gift for my best friend. The watch compliments her beauty and style. She loved it. The bling on the watch made it a perfect date night with her husband. The watch was not very expensive although it presented the look of a thousand dollars. I was very pleasantly surprised when my Bracelet Watch came! I chose the Rose color and it is beautiful! And the 3 choices of clasp was great because I just chose to use the smallest and it fit perfectly! 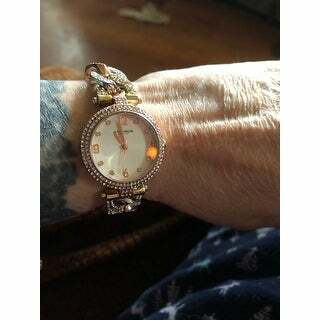 Bought this beautiful watch for my 80 year old mom who has trouble getting a watch to go around her wrist due to arthritis. It fits and she loves it! I like this purchase no buyers remorse so. I bought it to wear for special occasion outings. It has removable links so it can tailored to fit your wrist. I think this was a great buy for me. "Will the metal on this watch cause your skin to turn when worn or will coloring on medal come off?" This material of the watch band is metal and not stainless steel. Wanted a fashionable, good looking for watch at a great price. Eureka. Wanted something special with a good price and value.